He is known to be one of the greatest players in top-level professional sports. He ruled the world of squash for years and during his rule he created a record of remaining unbeaten for 555 games from 1981 to 1986, a record which is unmatched in almost any forms of sports. Jahangir started to play Squash at a very young age, coached by his father, Roshan Khan, the 1957 British Open Champion. With this fine pedigree he became arguably the finest Squash player in the history of the sport and one of the greatest sportsmen Pakistan has ever produced. In Australia in 1979 he became the youngest player ever to win the World Amateur title at the age of 15 years. He followed this by also becoming the youngest winner of the World Open Championship, beating Australia’s Geoff Hunt when still only 17 years old. Jahangir, whose name means “conqueror of the world”, totally ruled the world of Squash for 14 years. He won the prestigious British Open title for a record 10 times in a row, the World Open 8 times and was unbeaten by any opponent for an incredible 5½ years. During that time he won 555 matches consecutively, one of the longest unbeaten runs by any athlete in top-level professional sport. 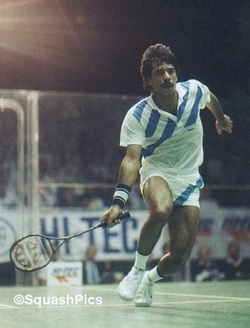 Jahangir Khan became a household name, not just in Pakistan, but throughout the world. Not only for his remarkable playing achievements but also for his exemplary conduct and behaviour as champion of the world, always humble both in victory and defeat. He retired from Squash in 1993 after helping Pakistan to win the World Team Championship in Karachi. The Government of Pakistan has honoured Jahangir with the awards of Pride of Performance and civil award of Hilal-e-Imtiaz for his achievements in Squash. Also, they recently awarded him with Sportsman of the Millennium. In 1990 he was elected Chairman of the Professional Squash Association and after his playing career finished he was elected Vice-President of the Pakistan Squash Federation in 1997. He was elected as Vice-President of the World Squash Federation in November 1998 and then from 2002 – 2008 was President of the World Squash Federation. Jahangir became Emeritus President of the WSF in 2008. Pakistan will always be proud of Jahangir Khan and his achievements which remain inspiration to date for all sports enthusiasts.